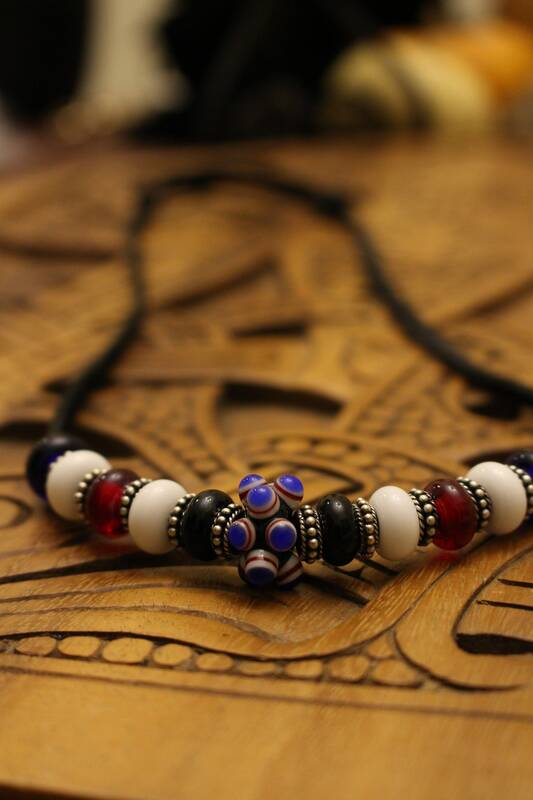 Replica Birka beads with Sterling Silver spacers. 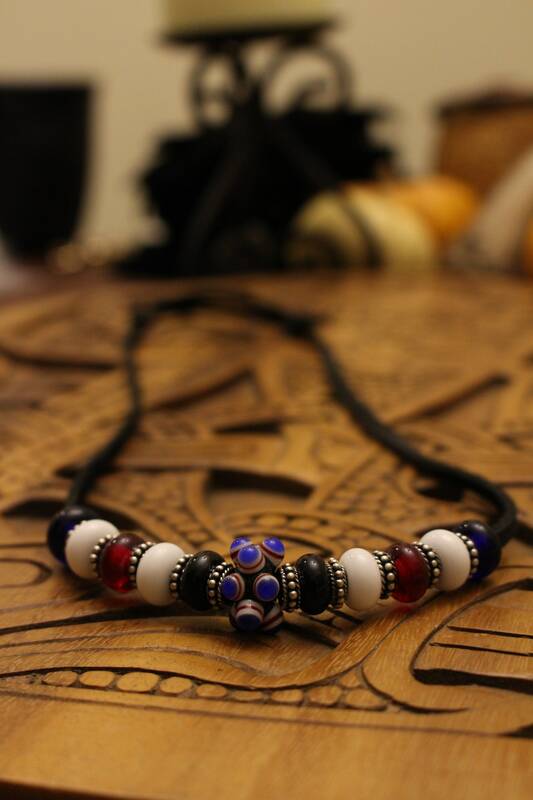 Materials: Glass (handmade), sterling silver beads (spacers), leather cord. Necklace Length - is adjustable and will fit all sizes. 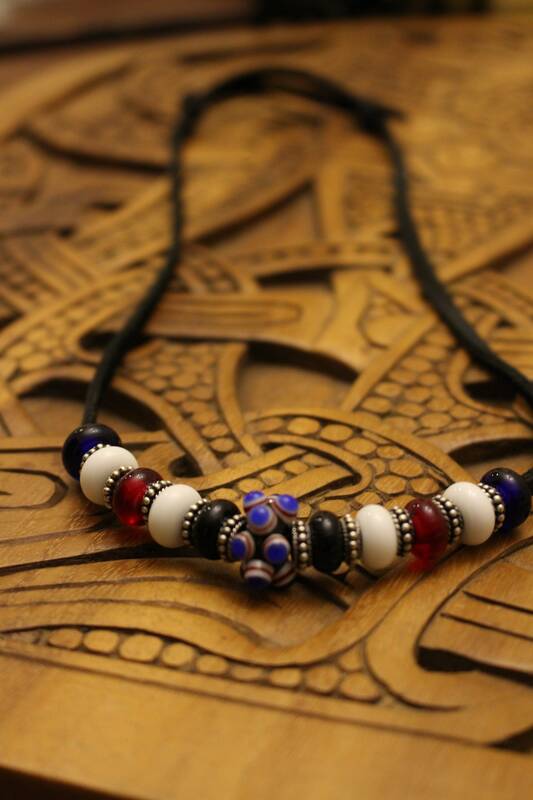 This striking necklace is designed with sterling silver and handmade glass beads (crafted in the traditional way) in colors and designs replicating those from Viking and Iron age Birka! The solid sterling silver spacer beads are crafted with an ancient technique of granulation, where each textured dot is hand placed, and the beads are handmade and annealed for strength and durability. 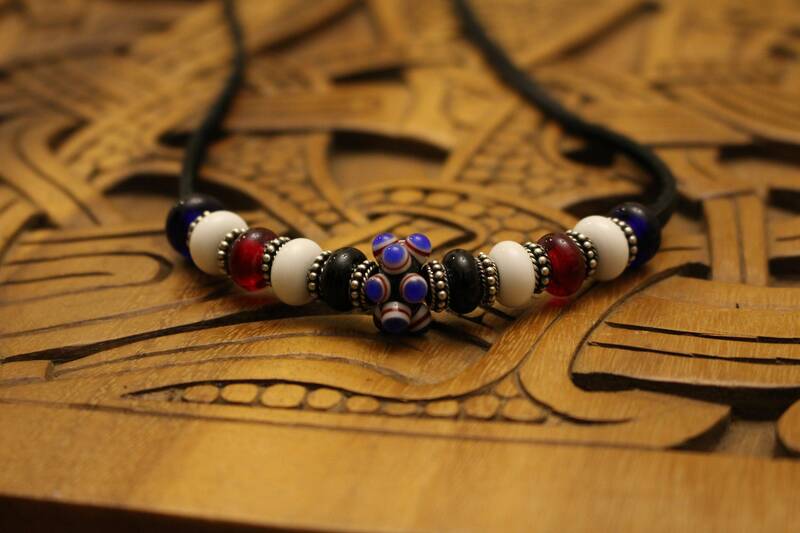 This necklace includes red, blue, black, and white solid beads as well as a stunningly beautiful and detailed central bead. They are all strung on a genuine leather cord, as the Vikings would have done. This central bead is exactly like those found at many ancient archaeological sites, and the concentric rings of color have been theorized to exemplify the “evil eye” motif commonly seen during this time period around Europe. Please let me know if you have any questions at all! **Want to design your own necklace?? 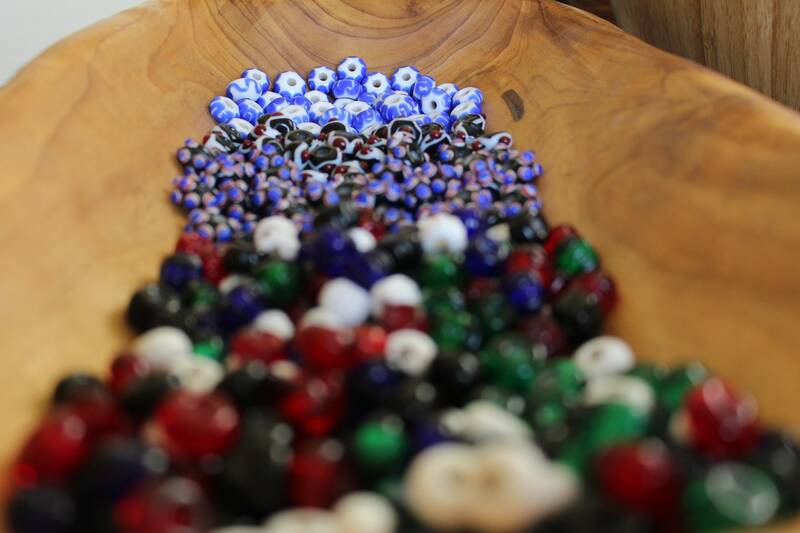 My shop sells individual handcrafted beads of all colors, and shipping will always be combined. Create your own anciently beautiful design! Silver shines and gold gleams, but glass was also one of the most valued treasures of the ancient world! 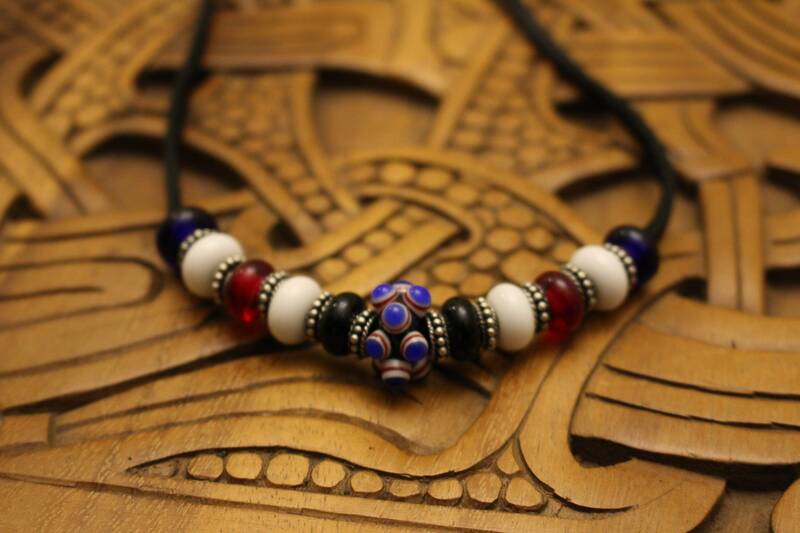 Celtic, Scandinavian, and Mediterranean cultures extensively created and traded these colorful accessories with each other. After the fall of the Roman Empire in 476 B.C., glass became more scarce, and thus in higher in demand and worth more. 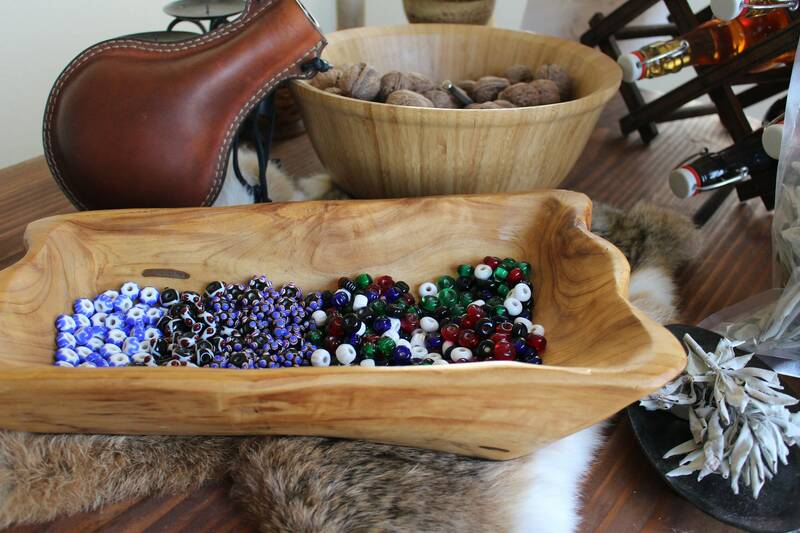 Shards were painstakingly collected and pillaged so they could be recycled into new beads. Single beads were buried with Viking warriors next to their weapons, and some were strung around their necks alongside their Mjölnir amulets. And they were special enough to be passed down for generations. During the Viking Age, the most popular glass bead colors in male graves seemed to be red, green, and white (in that order). They were used for trade, ritual, and as status symbols. Of course, Viking women collected and wore many glass beads of all colors. They adorned their belts with them, wore them in strings as necklaces, or (most commonly) hung them between their turtle brooches. Embellishments of bead shapes and patterns of contrasting dots, lines, and zig-zags all added to the diversity and beauty of these precious objects. Sometimes the Vikings even added gold and silver foiling!